Kapust, Daniel J. Flattery and the History of Political Thought: That Glib and Oily Art. Cambridge: Cambridge University Press. In production. 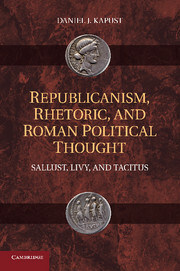 Kapust, Daniel J. Republicanism, Rhetoric, and Roman Political Thought: Sallust, Livy, and Tacitus. Cambridge: Cambridge University Press. 2011. Reviewed in: The Classical Journal, Bryn Mawr Classical Review, Greece and Rome, The Classical Review, Perspectives on Politics, New England Classical Journal, Latomus, Gnomon, Quarterly Journal of Speech, Historische Zeitschrift. Subject of roundtable at 2013 Midwest Political Science Association Annual Meeting, featuring Christina Kraus (Yale University), Michèle Lowrie (University of Chicago), Cary Nederman (Texas A & M), Gary Remer (Tulane), and Joel Schlosser (Bryn Mawr). edited volume with Gary Remer. Under contract with University of Wisconsin Press. Theory in Time and Place. Palgrave. 2016. Kapust, Daniel J. Advenit Cicero. Invited review essay on recent Cicero scholarship. political thought scholarship. Political Theory. Advance online publication. Smith on Propriety, Decorum, and Political Leadership.” American Political Science Review. February 2016. 1-12. Article subject of post by Emily Skarbek at EconLog, published by the Library of Economics and Liberty. Thought.” Political Theory. 41.4. 2013. 648-675. Monarchy.” Journal of Politics. 73.3. July 2011. 680-91.
of Political Theory. 10.1. January 2011. 92-113. Praxis Filosófica. 35. 2013. 257-282. Orator and Machiavelli’s Prince.” Political Studies. 58.3. June 2010. 590-608.
and the Historian’s Task” European Journal of Political Theory. 8.3. July 2009. 293-311. Journal of the History of Ideas. 69.3. July 2008. 353-373.
with Machiavelli’s The Prince.” History of Political Thought. 28.3. Fall 2007. 433-448. Ambiguity of Republican Liberty.” History of Political Thought. 25.3 Autumn 2004. 377-401.